Our Premium Holiday is our most popular collection, a great combination of a little bit sweet and little bit nutty. It has Chocolate Chip (4), Oatmeal Raisin (2), Peanut Butter (2), Sugar with Sprinkles (2), and our famous White Chocolate Macadamia (2). Our Premium Holiday collection is our most popular collection of our top 5 flavors! Chocolate Our most beloved cookie box collection, this collection has Chocolate Chip (4), Oatmeal Raisin (2), Peanut Butter (2), Sugar with Sprinkles (2) and the finale is our famous White Chocolate Macadamia (2). *Free Shipping! Choose from over 10 Holiday Box Wraps.! Be sure to put in your FREE GIFT MESSAGE! Each box holds 12-14 big cookies, each is approximately 3.0-3.5 inches in diameter and thick. Each cookie weighs 2.25 ounces. Only the finest ingredients! Pure like snow! Real butter, vanilla, Guittard Chocolates, Premium Flour, Cane Sugar...no holding back! Oatmeal Raisin- Fresh oats, raisins and walnuts sprinkled with a touch of coconut makes Blue Chip's Oatmeal Raisin the best in the country! We can add walnuts if you request. Peanut Butter: Peanut butter cookies never tasted so good. Blue Chip mixes the best peanut butter available and the freshest ingredients to make this old fashioned cookie truly delightful. Sugar with Seasonal Sprinkles. Tasty & delightful- an old fashioned favorite. White Chocolate Chip Macadamia Nut: Our very own creation dates back to 1982. This buttery rich cookie with Guittard white chocolate chips surrounded by Hawaiian macadamia nuts is truly decadent. Warning: this cookie may be habit forming! Order by 2:00 pm EST Monday-Wednesday and we will try to ship your gift that day! We ship Monday through Wednesday for arrival Tuesday through Friday (unless it’s a FedEx holiday). 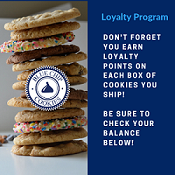 Our goal is to deliver them within 2 shipping days, as our cookies have no preservatives, and we want your recipients to enjoy freshness excellence. *We will ship on Thursday for Friday/Saturday delivery for special holidays and during busier times of the year. 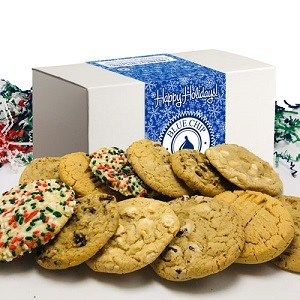 If you need something shipped on Thurday for Friday/Saturday please contact us at orders@bluechipcookies.com. From Michael W. of Chicago, Illinois on 12/2/2018 . From Gray Flex Systems, Inc. of Coats, North Carolina on 1/28/2016 . From gary of Overland Park, Kansas on 11/18/2015 . From Jim Fay, The Phoenix Enterprise of Rochester, New York on 7/18/2015 . From Chris M. of Fountain Valley, California on 3/10/2013 . 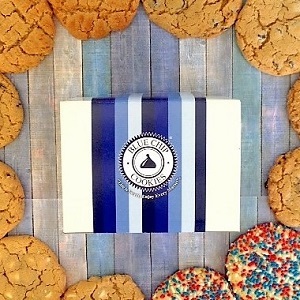 Create your own cookie collection and select from our everyday box wraps.